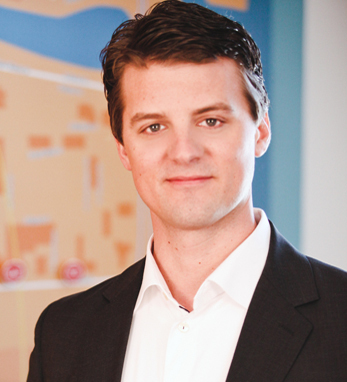 Matt Maloney has been the CEO of GrubHub Seamless since the spring, 2013 merger of the two largest online food delivery services, GrubHub and Seamless.com. Previously, Matt was the CEO of GrubHub, a company he co-founded in 2004 with his friend Mike Evans. In 2006, GrubHub won the University of Chicago’s New Venture Challenge and since then, Matt has seen the company through five rounds of investment funding and the acquisition of DotMenu. In 2012 he was Built in Chicago Moxie Award CEO of the Year. Matt, whose Maloney ancestors emigrated from Clare, holds a BS from Michigan State University and two masters degrees from the University of Chicago, in business administration and computer science. Irish heritage is important to both Matt and his wife, Holly, who have “been to Ireland three times, including one trip to the Dingle Peninsula to find her ancestors and a couple visits to the Guinness factory in Dublin.” Matt is a frequent contributor to the Wall Street Journal’s Accelerator’s Blog and currently sits on Illinois Governor Pat Quinn’s Illinois Innovation Council.